I'm home from a quick trip to Taiwan to send my grandmother off into the afterlife in peace. It was a bittersweet but meaningful experience and I was glad to stand there amongst all her grandchildren, performing Buddhist funeral rites. On the last day, I booked an appointment to add another piece to my "spice rack" tattoo collection. I added osmanthus blossoms (桂花) to honor the strong matriarchs in my family. Osmanthus smells intensely like ripened apricots, is a symbol for love, and is used in various teas and desserts in Taiwan. These flowers are in full bloom during the Chinese Mid-Autumn Festival which also happens to land on my lunar birthday. I brought a bag of dried flowers home to infuse into syrups for my mocktails. I'm using a no-heat method to preserve the aroma of the delicate flowers--it takes a little longer to infuse but it's worth it. If you can't find osmanthus blossoms, feel free to use another fragrant flower like dried lavender or rose buds. 1. 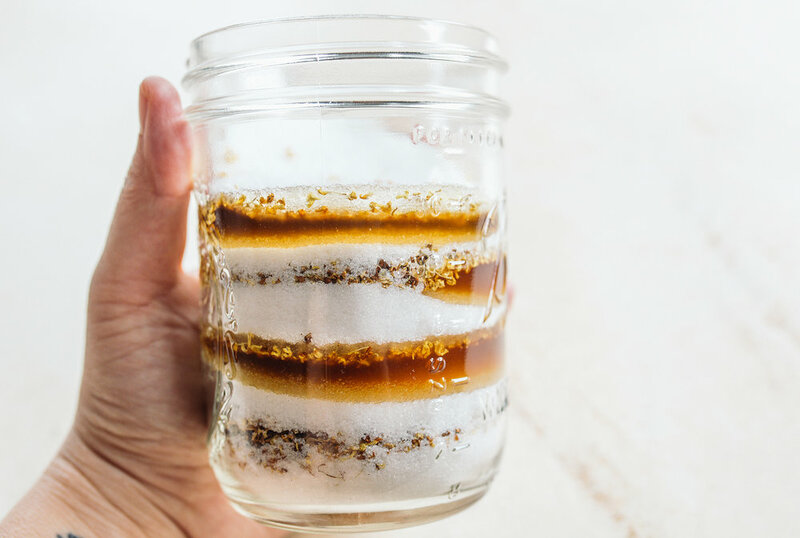 Add 1/2" of sugar to a mason jar. Then drizzle a Tbsp of honey on top. 2. Sprinkle osmanthus blossoms on top of the honey. 3. Repeat the layers until all ingredients are used but be sure to end with a layer of white sugar at the very top. 4. Seal the mason jar and store in a cool dark place. Wait 1 week for full syrup infusion. Use to sweeten tea, desserts, or mocktails.